You're lovely so chances are someone awesome (yourself or a beloved) will give you roses this Valentine's Day. A vase of fresh roses is great, but once the perky buds start to slump the celebration doesn't have to end. You can make rose water! If you have already have organic roses, dry the petals by laying them in a single layer over paper towels. If not, you can purchase fair trade, organic dried Red Roses from Mountain Rose Herbs. That's where I bought the roses used for this project. 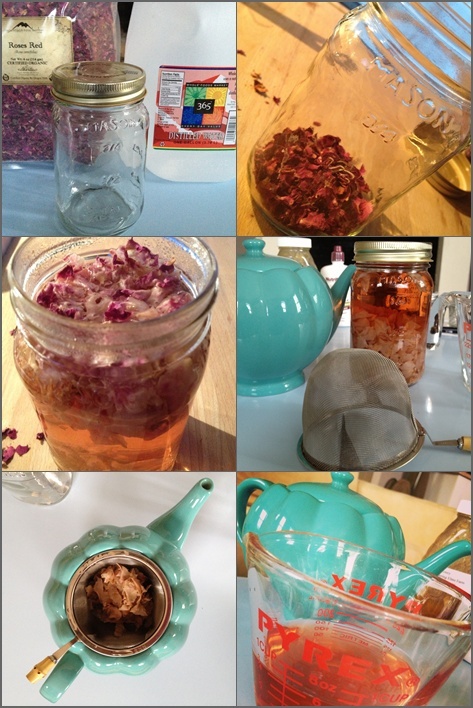 Put a handful of dried rose petals into a pint sized mason jar. Pour the water over the petals. Put the lid on the jar and leave on your counter overnight. Then next day, strain the water from the roses. Et voila, rose water! What do you do with rose water now that you've made it? There are lots of hair, skin, and culinary uses. I used the rose water to make an oil-free "hand lotion" recipe I found in Better Basics for the Home. It was combination of 1 part glycerin and 3 parts rose water with a bit of honey and grapefruit seed extract. While it is indeed moisturizing, I don't really like it as a hand lotion. I find it too sticky and unfamiliar to me since I am used to creamy oil-based lotions. Instead, I have been lightly misting this concoction into my hair. I think I like this application better. I also made a hair rinse by mixing 1/4 cup apple cider vinegar (ACV) with 3/4 cup rose-lavender water. (I steeped rose and lavender together, but plain rose water is fine too!) I shampooed my hair as usual (using Alaffia). Rinsed the shampoo out with water. Then did a final rinse with the floral-ACV mixture being careful not to get it in my eye. I love this! Read Cooling and Cleansing: The Benefits of Rose Water to read about the benefits of rose water and to discover more uses. Also, check out this curious recipe for Vegan Rose Water Almond Milk Pudding from May I Have That Recipe blog. How gorgeous would this be for Valentine's Day breakfast? And how about Vegan Pistachio-Rosewater Cookies, from the book Veganomicon by Isa Chandra Moskowitz and Terry Hope Romero, for dessert? Consider supporting this blog by shopping via my Amazon shop or buying my green cleaning eBook or shopping at Mountain Rose Herbs via my affiliate link. Thanks. I love Rose water for my skin and hair. Have thought about making my own for sometime now, so I will def be trying this soon. Thanks.